Paddle to the Sea Park! 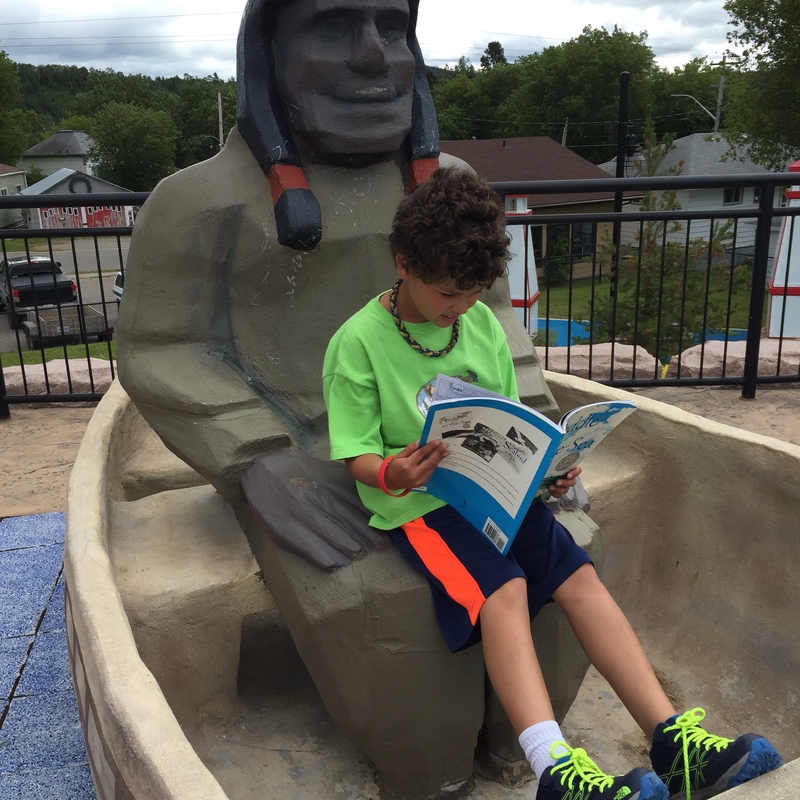 My son’s favorite book is “Paddle to the Sea.” It’s not really “about” anything as much as it is the travelogue of a toy carving of a wooden canoe with an Indian in it. It was given to my son by mistake. His grandparents had remembered it as one of his father’s favorite books. His father had never seen it before. It’s an easy mistake to make. 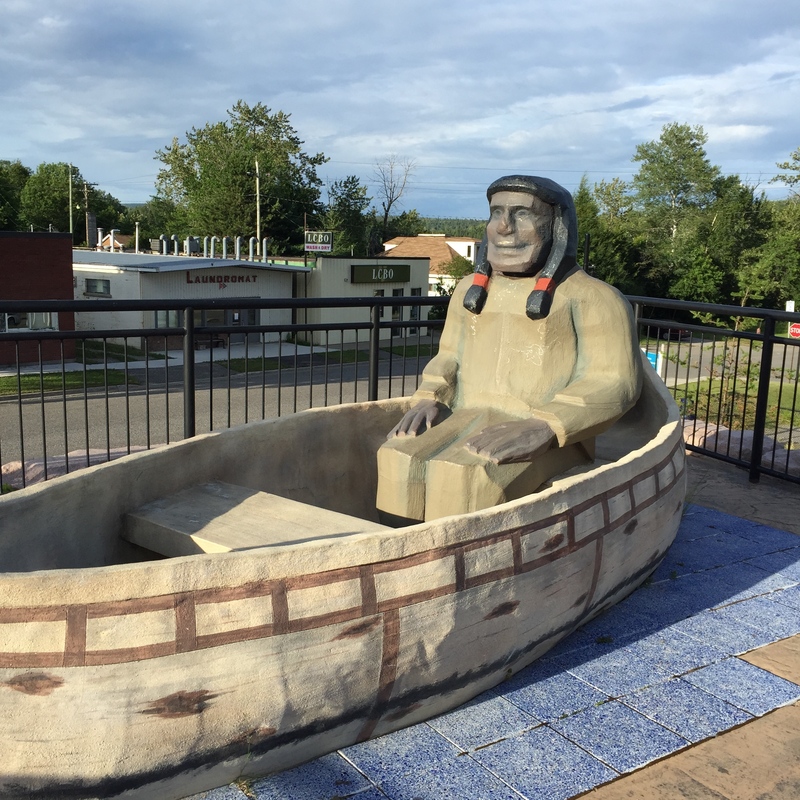 The book was written in 1941 and follows Paddle from Lake Nipigon in Canada through the Great Lakes and the St. Lawrence River all the way to the Atlantic Ocean. My husband’s favorite childhood book is One Morning in Maine by Robert McCloskey. It’s an exploration of (wait for it) the weather one morning in Maine. They are both the kind of book that leave normal kids asking when someone is going to fall through a magic wardrobe or into a covered wagon. Although people often look at his dark curls and bright blue eyes and declare my son his father’s mini-me, the truth is that usually, it is the two of us that are alike. We laugh at the same things, we cry at the same things and oh do we struggle with the same things. We are left-handed melon heads and we share a bond that those scientifically minded, right-handed tiny heads in our family don’t. But his love of sports, his love of nature, and his willingness to read and reread description after description of a place, those come from his father. 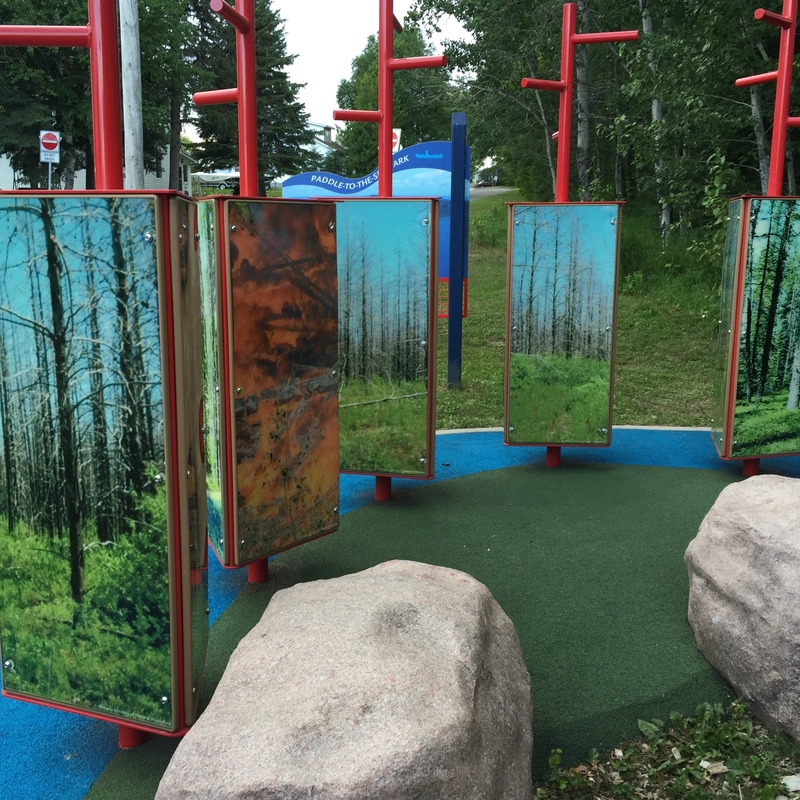 We had a trip planned to Lake Superior and my husband discovered that there was a park in Nipigon, Ontario based on Paddle to the Sea. 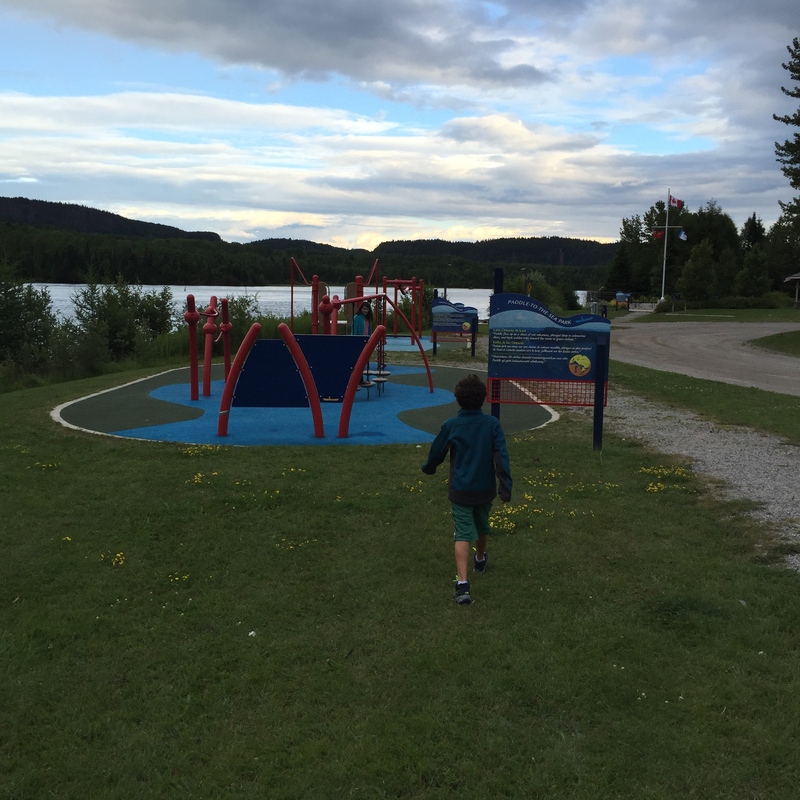 The whole way there, for days, my son and I annoyed my daughter and husband by singing a song we made up. The words are “Paddle to the Sea Park, what, what, what, what.” We’re considering making it the first release on an album we’re planning titled “Joey from the Block, feat. Lil’ Mama.” My husband and daughter put up with a lot from us. While singing the song we both secretly worried that the park might not live up to our expectations, while insisting to my daughter that it would. 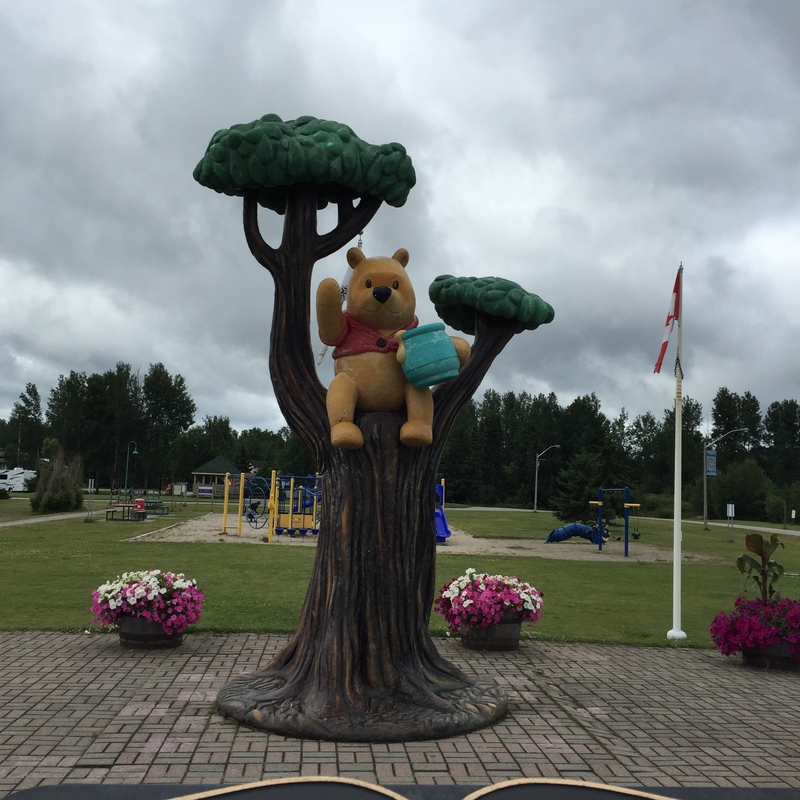 We became more worried when we stopped in White River, Ontario, apparently the birthplace of the bear Winnie who, named after Winnipeg, would go live in the London Zoo and provide the inspiration for Winnie-the-Pooh (my type of childhood book by the way). This was their park. 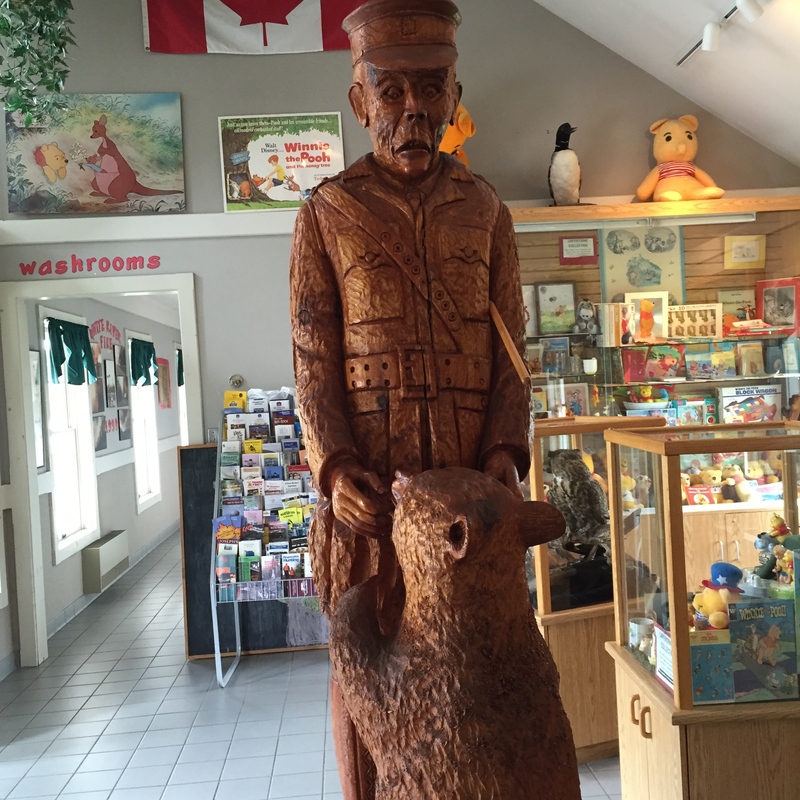 There was also this statue, which, um I am including without comment. But Paddle to the Sea did not disappoint. The park covers several blocks. 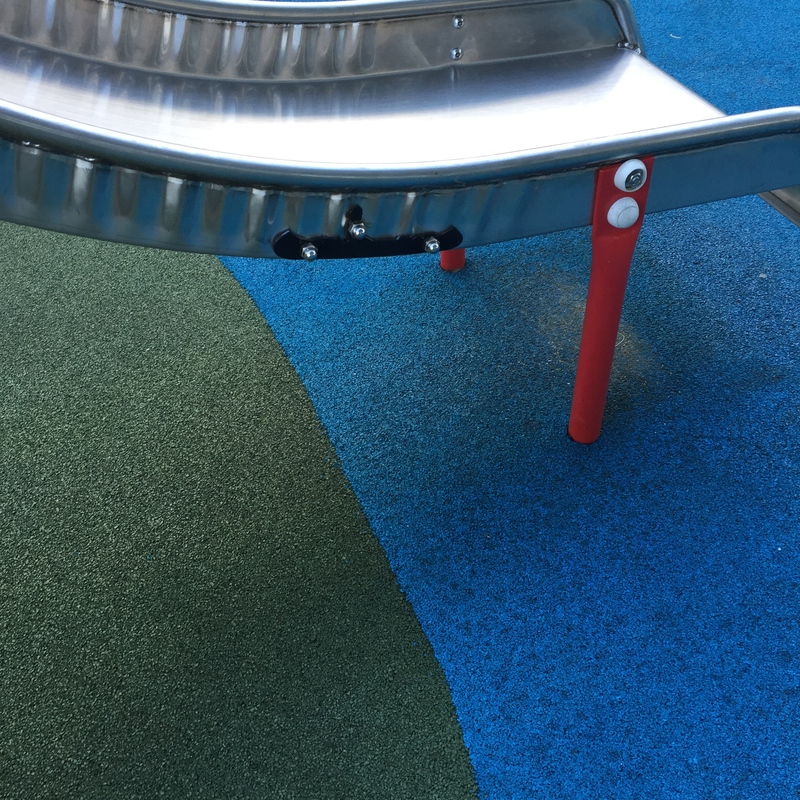 For the most part, each part of the park is normal playground equipment that’s simply been arranged and themed to cover a part of the book. Here’s a bridge that Paddle crosses under. Here’s the forest fire he passes through. But if you look closely, you see a tiny figure of Paddle to the Sea hidden in each section. We played in the park for over an hour. Spent the night in a nearby hotel and went back the next day to play again and pose with Paddle. Then we moved on. We followed more of Paddle’s adventure, and created our own. One day I’m sure that I will give my son’s kid a copy of Paddle to the Sea. Who knows, I may also give that child another book that my son never read and a whole new adventure will start. 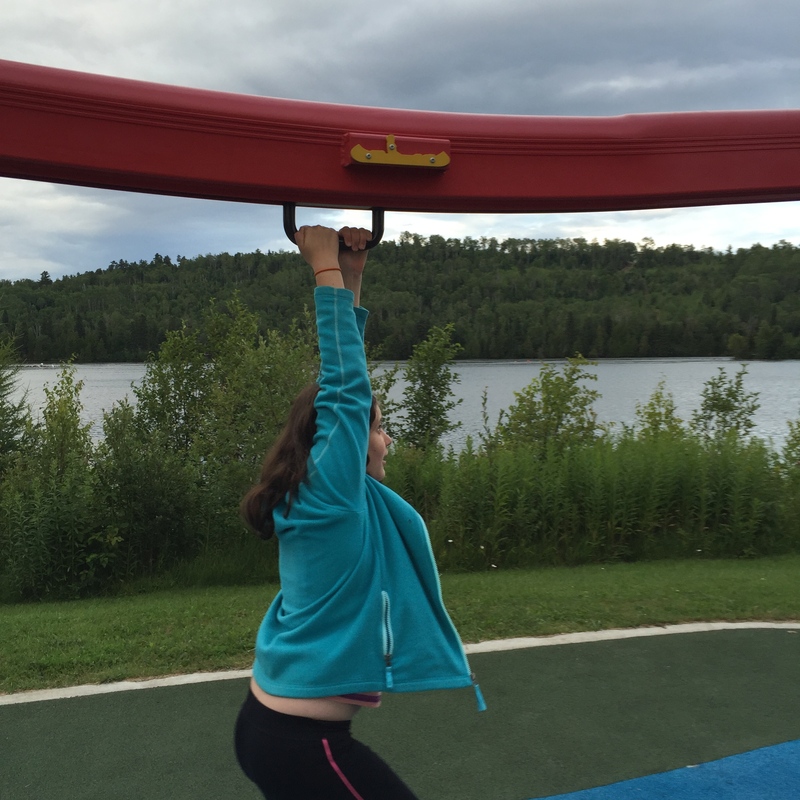 This entry was posted in Family Life and tagged Canada, literature, play, reading, travel. Bookmark the permalink. 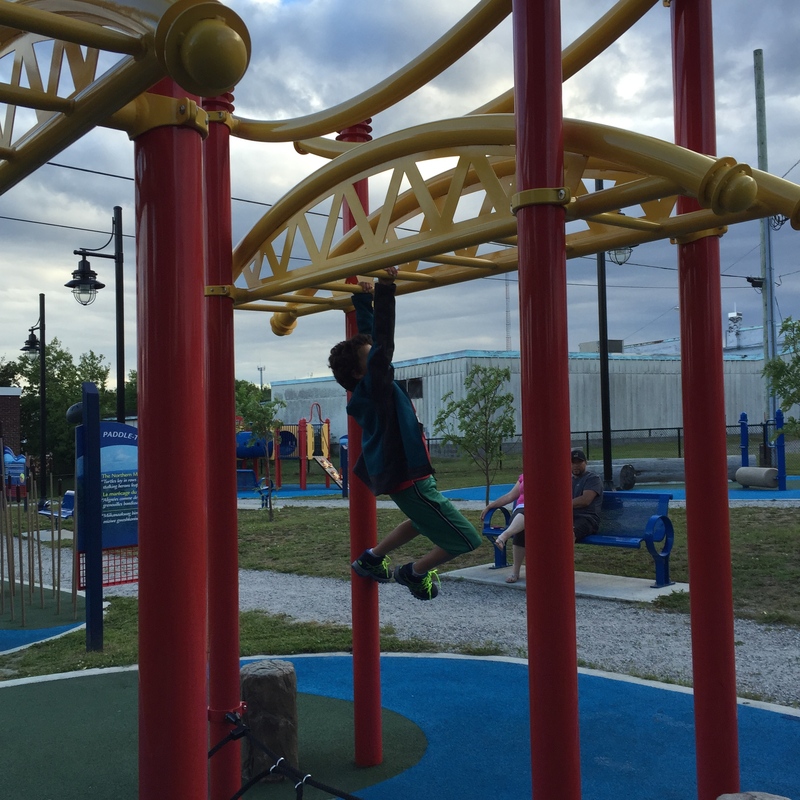 3 Responses to Paddle to the Sea Park! I need a wooden souvenir of the Indian in the canoe to give as a gift. Do you know where I can find it? Sorry, we looked everywhere in that town and no one had one. I don’t think they make them. I was trying to find the same thing. I found this handmade replica online! Thought you may be interested too!